Joey made it out to play in the snow once before it all melted. Clearly he enjoyed himself. Joey loves playing with his big brother and sister. He puts up a stink if I set him down in one room and he can hear the big kids playing in another room. He loves holding measuring spoons, going for walks in the stroller, and eating food, as evidenced by those cheeks and chins. He hates tummy time, meaning he is no where near crawling. I think if he realized he could get where he wanted to go by crawling he would make a little more effort. I buy three bunches of eucalyptus at Trader Joe’s, plus two bunches of golden rod and some purple statice. I don’t usually keep fresh flowers in the house during Lent but we’ve got 8 foot icicles hanging off our roof, 4 feet of snow in our yard. and we’re currently digging out from our most recent snow storm. On top of that it’s been a long dark winter of kids getting sick, temps too low to go out with a baby, and my mind totally preoccupied with the health concerns of my oldest. Instead of the start of a penitential season, Lent this year feels like the continuation of the penitential season I’ve been in since January. I know that eventually I will get there, I will lean into Lent and mortify my flesh and walk the road to Calvary, but for now, darn it, I need signs of life. So I buy fresh flowers and eucalyptus. Confession: I can probably count on one hand the number of books that I read between my college graduation and the birth of my first child. And if I was reading very little before becoming a mother, I basically stopped reading altogether after I started having kids. But I wasn’t always a non-reader. My childhood and teen years were marked first by Laura Ingalls Wilder and Anne of Green Gables, and then by The Lord of the Rings, Jane Austen, and Charles Dickens. I remember showing up to my high school job a few minutes late and with a tear-stained face because I just had to finish Great Expectations before my shift started. The beginning of my non-reading started in college, oddly enough. As a music major a lot of my free time was spent in the practice rooms. I read what I had to for my classes, and that was about it. One of the greatest lessons I learned as a music major was that to get good at something you have to practice, everyday. When I stopped the practice of reading, I got really bad at it. I love doing a Year In Review post each year. It’s so fun to see everything that happened during the last 12 months, and to see how much everyone grew! (And they grew a lot!) But more than that it reminds me of all the blessings that last year has brought. I was suffering through the tail end of morning sickness while pregnant with Joey. Alex started his new job as a PA in ENT. (Wow! That means he’s been there a year already!) 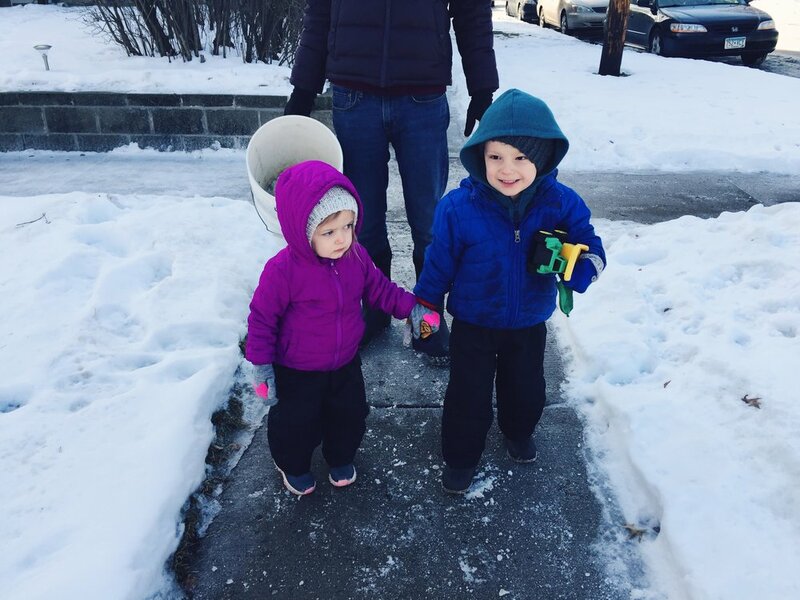 We got better at playing outside, and at being cozy inside. Alex and I took our first ever trip without kids to NYC. 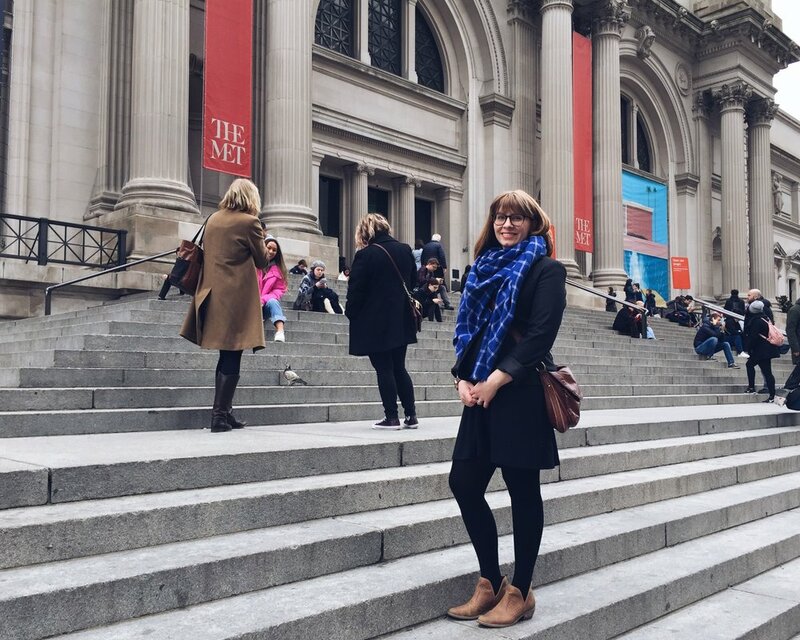 We had a great time checking out The MET, lots of yummy food, and Purl Soho! Winter would not be complete without some good knitting projects. This photo is reminding me that this sweater still fits Trixie and that I should have her wear it (read: bride her with chocolate). We also found out that we would be having a baby BOY!! I started making mental preparations for the arrival of another baby. Winter last year went out like a lion, dumping a giant blizzard on us right in the middle of April. But spring did eventually come and we went out into it as often as we could. I entered the third trimester, during which I documented my favorite maternity things in this post. We got the garden in and I had so much fun cutting flowers to bring into the house. Johnny turned 5! And the royal wedding got me thinking all sorts of thoughts about marriage. Summer break brought lots of time out of doors - rain or shine. Puddle walks inspired by Peppa Pig, naturally. I read Hannah Coulter and it basically changed my life. I also waited and waited and waited for my baby to arrive, And then, nine days after his due date, he finally came! Welcome Joseph Terence! We soaked up lots of baby snuggles and adjusted to being a family of 5. We enjoyed the last of the warm weather. Trixie turned 3! And Alex and I celebrated 9 years of marriage. Sweater weather! Joey just loves wearing his hand knits. And I love making them. While we were in the thick of Advent and getting excited for Christmas, Johnny lost his first tooth! 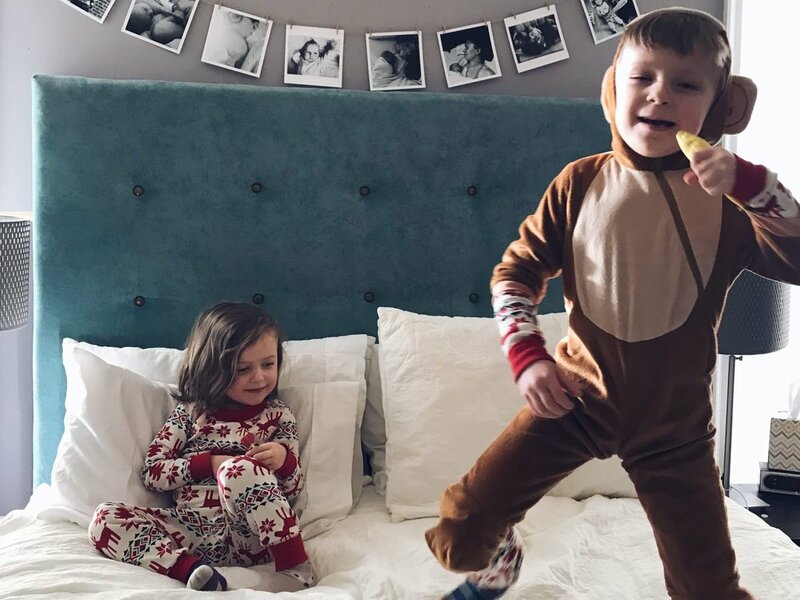 I got my kids matching pajamas and they wore them for about 4 days straight over Christmas., which was fine by me. Happy New Year to you and yours! I hope that 2019 brings you much JOY! 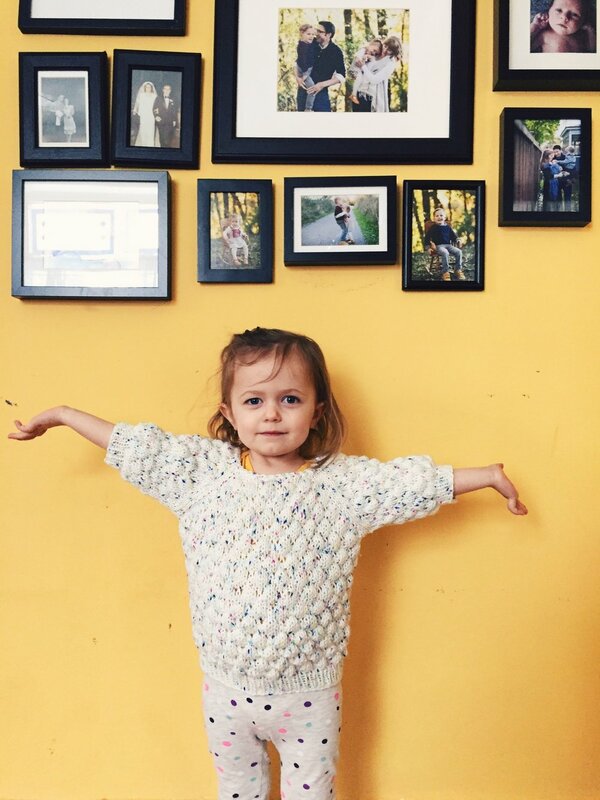 linking up with Bobbi for this fun post. P.S. You can get your Healthy Meal Planning Bundle NOW through January 7! Click the banner below for more info!! Snuggle them while you can. There is my five-year-old is carrying his tooth around in a little glass jar for safe keeping, until he can place it under his pillow tonight. It’s one of those mind-blown, how-did-we-get-here things. I have a vivid memory of when that same tooth first came in. How was that not just yesterday?